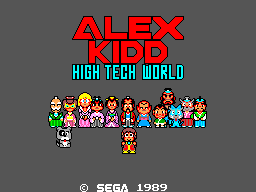 Alex Kidd in High Tech-World was the third Alex Kidd release in the United States and Europe. The game is often bashed as the worst in the series. But is this true? In my review, I will explore the ups and downs of this infamous title. In this title you play as Alex Kidd, the famous hero of "Alex Kidd in Miracle World" and its Arcade port sequel "Alex Kidd in the Lost Stars." Alex Kidd hears that a new arcade has open near his hometown! He can't wait to go and play the latest SEGA games (Even though he is a prince, I guess he is to cheap to just buy a Master System? ), however, his friend has torn up the map! Now Alex needs to find the lost map pieces and get to the arcade before it closes! There are also ninja enemies in the second level for some odd reason. This game is a typical, albeit, slow paced, side scroller. Each level plays differently. In the first level, you explore the castle that is Alex's home. There are no enemies, and you wander about looking for the map. After that, you go into the woods and battle ninjas. This level is more true to the other titles, as there is some combat between Alex and his enemies. The graphics are “cute” and colourful. The sprites used in the woods and the castle stages are very good and pretty well detailed. However, they are not as good as the graphics in the last two Alex Kidd games. Alex is a bit out-of-proportion with everything and everyone else in the game, which makes playing it a little odd. It is also hard to tell what some things are, thus, making it easy to get a game over, because you cannot distinguish between your enemies and a stove in Alex’s kitchen...oh wait, the stove IS an enemy. The music is very good and extremely clear for an 8-bit title. It can get repetitive and a tad bit annoying, but it does fit every scene. 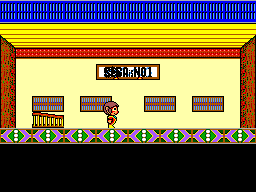 Compared to Alex Kidd in Miracle World, the music is horrible, but compared to most other 8-bit games it is glorious. You won’t want to turn off the volume, and if you do, you will probably turn it back on after a short time. This is a weak spot. The controls are pretty bad. When I first played the game, I suspected my controller was busted. It was the first SMS game I had, and I was testing to see if the system worked by using this game. Movement is very difficult, and annoying. Alex doesn’t always respond to what you tell him to either. And going up and down the stairs is a real annoyance because of the bad controls. 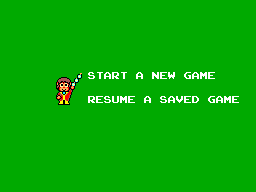 Alex Kidd in High Tech World has little replay value. It is not the best game, and whereas it isn’t horrible, it is not exciting and there are no “secrets” to unlock. After you beat it, which isn’t hard to do, you may play it again solely because you have nothing else to do, but other than that, its replay value is low if any.